Mehmed III (Ottoman Turkish: محمد ثالث‎, Meḥmed-i sālis; Turkish: III. Mehmet; 26 May 1566– 21 December 1603) was Sultan of the Ottoman Empire from 1595 until his death in 1603. Mehmed was born at the Manisa Palace in 1566, during the reign of his great-grandfather, Suleiman the Magnificent. He was the son of Şehzade Murad (later Murad III), himself the son of Şehzade Selim (later Selim II), who was the son of Sultan Suleiman and Hürrem Sultan. His mother was Safiye Sultan, an Albanian from the Dukagjin highlands. His great-grandfather died the year he was born and his grandfather became the new Sultan, Selim II. His grandfather Selim II died when Mehmed was eight, and Mehmed's father, Murad III, became Sultan in 1574. Mehmed thus became the Crown Prince until his father's death in 1595, when he was 28 years old. Mehmed III remains notorious even in Ottoman history for having nineteen of his brothers and half-brothers executed to secure power. They were all strangled by his deaf-mutes. Mehmed III was an idle ruler, leaving government to his mother Safiye Sultan, the valide sultan. [unreliable source] His first major problem was the rivalry between two of his viziers, Serdar Ferhad Pasha and Koca Sinan Pasha, and their supporters. His mother and her son-in-law Damat Ibrahim Pasha supported Koca Sinan Pasha, and prevented Mehmed III from taking control of the issue himself. The issue grew to cause major disturbances by janissaries. On 7 July 1595, Mehmed III finally sacked Serdar Ferhad Pasha from the position of Grand Vizier due to his failure in Wallachia and replaced him with Sinan. In reward for his services at the war, Cigalazade Yusuf Sinan Pasha was made Grand Vizier in 1596. However, with pressure from the court and his mother, Mehmed reinstated Damat Ibrahim Pasha to this position shortly afterwards. However, the victory at the Battle of Keresztes was soon set back by some important losses, including the loss of Győr (Turkish: Yanıkkale) to the Austrians and the defeat of the Ottoman forces led by Hafız Ahmet Pasha by the Wallachian forces under Michael the Brave in Nikopol in 1599. In 1600, Ottoman forces under Tiryaki Hasan Pasha captured Nagykanizsa after a 40-day siege and later successfully held it against a much greater attacking force in the Siege of Nagykanizsa. Another major event of his reign was the Jelali revolts in Anatolia. Karayazıcı Abdülhalim, a former Ottoman official, captured the city of Urfa and declared himself sultan in 1600. The rumors of his claim to the throne spread to Constantinople and Mehmed ordered the rebels to be treated harshly to dispel the rumors, among these was the execution of Hüseyin Pasha, whom Karayazıcı Abdülhalim styled as Grand Vizier. In 1601, Abdülhalim fled to the vicinity of Samsun after being defeated by the forces under Sokulluzade Hasan Pasha, the governor of Baghdad. However, his brother, Deli Hasan, killed Sokulluzade Hasan Pasha and defeated troops under the command of Hadım Hüsrev Pasha. He then marched on to Kütahya, captured and burned the city. In 1599, the fourth year of Mehmed III's reign, Queen Elizabeth I sent a convoy of gifts to the Ottoman court. These gifts were originally intended for the sultan's predecessor, Murad III, who had died before they had arrived. Included in these gifts was a large jewel-studded clockwork organ that was assembled on the slope of the Royal Private Garden by a team of engineers including Thomas Dallam. The organ took many weeks to complete and featured dancing sculptures such as a flock of blackbirds that sung and shook their wings at the end of the music. The musical clock organ was destroyed by the succeeding Sultan Ahmed I. Also among the English gifts was a ceremonial coach, accompanied by a letter from the Queen to Mehmed's mother, Safiye Sultan. These gifts were intended to cement relations between the two countries, building on the trade agreement signed in 1581 that gave English merchants priority in the Ottoman region. Under the looming threat of Spanish military presence, England was eager to secure an alliance with the Ottomans, the two nations together having the capability to divide the power. Elizabeth's gifts arrived in a large 27-gun merchantman ship that Mehmed personally inspected, a clear display of English maritime strength that would prompt him to build up his fleet over the following years of his reign. The Anglo-Ottoman alliance would never be consummated, however, as relations between the nations grew stagnant due to anti-European sentiments reaped from the worsening Austro-Ottoman War and the deaths of Safiye Sultan's interpreter and the pro-English chief Hasan Pasha. Mehmed died on 22 December 1603 at the age of 37. According to one source, the cause of his death was the distress caused by the death of his son, Şehzade Mahmud. According to another source, he died either of plague or of stroke. He was buried in Hagia Sophia Mosque. He was succeeded by his son Ahmed I as the new sultan. ^ Peirce, Leslie P. (1993). The Imperial Harem: Women and Sovereignty in the Ottoman Empire. New York: Oxford University Press, Inc. p. 94. ISBN 0-19-507673-7. Murad's favorite was Safiye, a concubine said to be of Albanian origin from the village of Rezi in the Ducagini mountains. ^ Quataert, Donald (2000). The Ottoman Empire, 1700-1922. Cambridge University Press. p. 90. ISBN 0-521-63328-1. ^ a b c "Mehmed III". İslam Ansiklopedisi. 28. Türk Diyanet Vakfı. 2003. pp. 407–413. ^ Karateke, Hakan T. "On the Tranquility and Repose of the Sultan." The Ottoman World. Ed. Christine Woodhead. Milton Park, Abingdon, Oxon; New York: Routledge, 2011. p. 120. ^ Goodwin, Jason. Lords of the Horizons: A History of the Ottoman Empire, p.166. New York: Henry Holt & Company. ^ a b "Mehmed III". Büyük Larousse. 15. Milliyet Newspaper Press. pp. 7927–8. ^ Malcolm, Noel (2004-05-02). "How fear turned to fascination". London: telegraph.co.uk. Retrieved 31 October 2013. ^ a b "An eye for detail". BBC News. December 21, 2007. ^ Christine Woodhead (28 April 2011). "ENGLAND, THE OTTOMANS AND THE BARBARY COAST" (PDF). Retrieved 28 August 2017. ^ Güzel, Hasan Celâl; Oğuz, Cem; Karatay, Osman (2002). The Turks: Ottomans (2 v. ). ^ Börekçi, Günhan (2010). 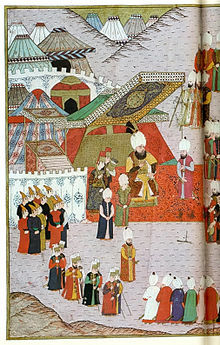 Factions And Favorites At The Courts Of Sultan Ahmed I (r. 1603-17) And His Immediate Predexessors. pp. 89, n. 25. ^ Ipşırlı, Mehmet (June 1976). Mustafa Selaniki's history of the Ottomans. p. 172. ^ a b c d e Tezcan, Baki. Searchimg For Osman: A Reassessment Of The Deposition Of Ottoman Sultan Osman II (1618-1622). pp. 330 and n. 29. ^ Börekçi, Günhan. İnkırâzın Eşiğinde Bir Hanedan: III. Mehmed, I. Ahmed, I. Mustafa ve 17. Yüzyıl Osmanlı Siyasî Krizi - A Dynasty at the Threshold of Extinction: Mehmed III, Ahmed I, Mustafa I and the 17th-Century Ottoman Political Crisis. p. 78. ^ a b Tezcan, Baki. The Debut Of Kösem Sultan's Political Career. p. 357. ^ Sakaoğlu, Necdet (2008). Bu mülkün kadın sultanları: Vâlide sultanlar, hâtunlar, hasekiler, kadınefendiler, sultanefendiler. Oğlak Yayıncılık. p. 303. ISBN 978-9-753-29623-6. ^ And, Metin (1982). Osmanlı şenliklerinde Türk sanatları. Kültür ve Turizm Bakanlığı. p. 16.